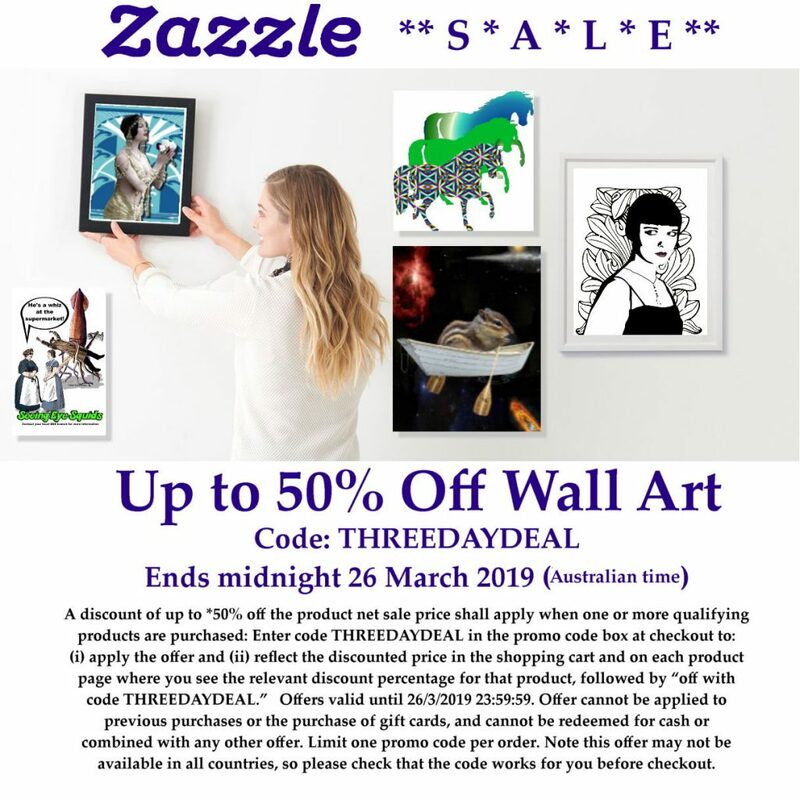 There’s up to 50% off all wall art in Miss Terry Woman’s Zazzle store in Australia. that the code works for you at checkout, before proceeding. Miss Terry Woman’s clearance sale in our CafePress store! This offer is not for just the one day, nosirree! It’s for the entire month of November 2018! Note: offer excludes shipping charges, gift wrap charges and applicable sales tax. Coupon code CPGIFTSNOW must be entered at checkout. Promotion ends on November 30, 2018, at 11:59 p.m. (ET-USA). Discount does not apply to specially-priced CafePress products, fulfilment products, bulk orders, or any product numbers starting in 030. Offer valid online at CafePress.com only, cannot be combined with any other coupons or promotions, and may change, be modified or cancelled at any time without notice. This promotion cannot be applied to past orders. Note also: this offer may not be available in all countries. Please ensure it works for you at checkout before proceeding. with 20% off posters and MORE!! Note: this offer is only available in our Zazzle Australian shop. This offer excludes embroidery digitisation, screen-printed apparel, fabric and gift cards. This offer may not be combined with any other Zazzle promotional or volume discount offers and may not be applied to past purchases. Note too: please ensure that the code works for you at checkout before proceeding, as the offer may not be available in all countries. It’s time for a quick sale with up to 50% off !! What’s on offer? There’s 50% off posters and 15% off across the store. Note: This offer excludes embroidery digitization, screen-printed apparel, fabric and gift cards. This offer may not be combined with any other Zazzle promotional or volume discount offers and may not be applied to past purchases. Note also that this offer may not be available in all countries, so please ensure it works for you before proceeding through checkout. PLUS 15% off everything else. Kit out all the family with our favourite styles. Enter the promo code BIGSHIRTSALE during checkout to receive the offer. NOTE: This offer excludes embroidery digitisation, screen-printed apparel, fabric and gift cards. Note also that this offer may not be available in all countries, so ensure the code works for you at checkout before proceeding. There’s 30% off t-shirts! Yay! Note: this offer excludes embroidery digitisation, screen-printed apparel, fabric and gift cards. Note also that this offer may not be available in all countries so ensure the code works for you at checkout, before proceeding. Woah! Another SALE in My UK Store! Note that this offer cannot be combined with other discounts or coupon codes. Note also that this offer may not be available in all countries, so please ensure the code works for you at checkout, before proceeding. Offer ends midnight (USA time) 2 April 2018. Note: this offer may not be available in all countries so ensure this code works for you at checkout before proceeding. Note also: This offer excludes embroidery digitisation, screen-printed apparel, fabric and gift cards. This offer excludes embroidery digitisation, screen-printed apparel, fabric and gift cards. This offer may not be combined with any other Zazzle promotional or volume discount offers and may not be applied to past purchases. Note: this offer may not be available in all countries, so ensure the code works for you at checkout, before proceeding.